The regional pattern: East Asia and SE Europe, low; Latin America, Muslim, and African, high; and developed countries, moderate. It's interesting that an altruistic spirit has little to do with how well a country actually serves the needs of its people. The service-oriented nations in the list generally do a poor job. In fact, Japan and Korea--the last two on the list--have produced successful societies without a strong feeling of duty to others. Western countries have created high levels of well-being with only very moderate amounts of altruism. And while the United States has the reputation of a gang of heartless capitalists, it ranks as the most service-minded country among developed nations. I can examine this more systematically when I have finished building a data set, but these patterns might reflect the religious culture of the people. The Catholic Church may have taught Puerto Ricans to believe in the importance of serving others, even if they don't always do it. On the other hand, Japanese people might be good neighbors, even though they don't have the same kind of religious culture. I see a few patterns here: Developed countries are the most trusting. China, however, is an example of a trusting, less developed nation. Other Asian countries also tend to be less cynical (the Philippines being a strong exception). As a group, Latin American countries are cynical, which contradicts my image of the gregarious Hispanic. Muslim, Eastern European, and Sub-Saharan African countries are on the cynical side (Iraq and Iran are important exceptions). The explanation of these patterns is not clear, but attitudes may in some degree reflect experience. For example, a country like Sweden is an orderly, honest society, so living there inspires faith in human nature. A history of government corruption might be part of the story. Steve Sailer argues that high rates of cousin marriage create tightly-knit clans who are suspicious of each other, which might explain some of the Muslim cases. Do you see a connection between ethnic diversity and mistrust? I'm not sure. America seems to be on the less trustful end of wealthy countries. I plan to build a data set, so I can calculate correlations between variables like these. Baptists in the number one spot go to church an average of almost once per week: for Muslims it's maybe twice a month. I'm mystified why the GSS does not ask if you're Mormon, Jehovah's Witness, etc., so we don't know about those groups. On the other end of the scale, the religious slackers are Buddhists, Jews, and Native Americans. Jews vs. Episcopalians, Part V: We've seen thus far that these two groups are similar in several ways (expect for income, where Jews make more). Let's finish up with a look at religious and political participation. Jews are one of these least religious groups in the country, at least as indicated by frequency of attendance at religious services. The average Jew goes perhaps a few times a year, whereas Episcopalians (Es) average about once a month. The numbers even out, however, when we broaden the question to membership in some kind of organization related to religion: 37% of Jews and 35% of Es says yes to this question. As for politics, Jews are, not surprisingly, more liberal: only 22% voted for Bush in 2000, while 53% of Es did. Thirty-eight percent of Jews have given money to a political cause or candidate: for Es, the number is 33%. Fifty-six percent of Es have lobbied local politicians on some issue: 52% of Jews have. For higher-level officials, it's 52% of Jews and 50% of Es. So along the dimensions I've looked at, these groups look quite similar, except that Jews have higher incomes, yet vote Democrat. The higher incomes might be explained simply by the fact that the average Jew lives in a city of 1.7 million people, while Es live in cities averaging only 450,000. (Both are concentrated on the east and west coasts). The two groups work similar hours: 41.2 hours/week for Jews and 42.4 for Es (this includes part-time workers). If a Muslim is more religious, is he more in favor of terrorism? I was interested in this question, so I analyzed recent data from the World Values Survey. In two countries--Pakistan and Algeria--thousands of people were asked if they approved of 9/11, as well as being asked how often they attend religious services. Results differed for the two countries. First, 22.4% of Algerians approved (or strongly approved) of the attacks, whereas only 3.5% of Pakistanis did. In Algeria, more religious people were slightly more supportive: 26% of those going to services more than once a week favoring the terrorism: 21% of those who never go were supportive. By contrast, only 0.4% of frequent attenders in Pakistan were pro-terrorist, while 14.4% of those who rarely attend were. The narrowest of victories: Jews 110, Episcopalians 109: Using the vocabulary test data from the General Social Survey, I estimated the IQs for American Jews and white Episcopalians (Es) (about 10% of Es are black). Setting the American white average at 100, Js come in at 110, which doesn't surprise me, and Es weigh in at 109, which makes them surprisingly similar to Jews. My Jewish estimate is lower than La Griffe's, which is 116. One reason mine is lower might be that La Griffe studied Ashkenazi Jews, and while most Jews are in the GSS sample are also Ashkenazi, 150,000 Jewish Americans are Sephardic--a group with a lower average IQ. Studies of Jewish IQ have also noted more variation than in general populations, but according to the GSS, the standard deviation is only slightly larger than that of all white Americans (or Es). Jews vs. Episcopalians, Part III: Let's continue to gain perspective on two of America's important religious groups. A very simple question is: which group is bigger? According to the General Social Survey, 1.99% (or 5.9 million) of Americans are Jewish, and 2.02% (or 6 million) are Episcopalian. Almost identical in size. Jews vs. Episcopalians, Part II: We saw in Part I that Jews (Js), on average, have larger incomes than Episcopalians (Es), but is that simply due to higher status jobs? I looked at average occupational prestige scores (that range from 0 to 100) and found that it was 51.7 for Js and 49.5 for Es. This is not much of a difference. Jews vs. Episcopalians, Part I: I thought it would be interesting to compare two high-status religious groups in America. The General Social Survey does not allow us to look at elites within these two communities, but we can see how groups compare overall. Let's begin with income. For 2004, the average Jew is roughly $60k, while the typical Espicopalian is approximately $40k, so there is no comparison in terms of income. I also noticed that Episcopalians have a larger standard deviation which indicates a broader range of incomes within this group. More successful people are less permissive of tax evasion, not more. Now granted, this is attitude and not behavior, but the two are probably correlated. I imagine that envy makes it easy for us to exaggerate the flaws of people above us. The wondrous blessing of feminism: Feminists cherish female autonomy and have thus championed the pursuit of a career. Abortion freedom has become a core value of liberals because it also preserves independence. Sociologists have established that the main cause of the increase in divorce over the last 5 decades is the movement of women into the workplace. (And sociologists would rather suffer genital electrocution than produce a conservative finding). So tens of millions of our young ones have either experienced the divorce of their parents or, slightly worse, death in order to keep women freer. Seems like the cost is a tad heavy, but at least women are happier. 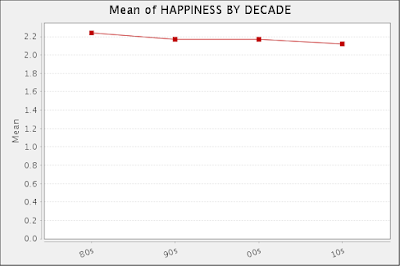 Uhm, no they're not: according to the General Social Survey, women are not one bit happier than they were in 1972. Death and trauma reign down on our little ones for nothing. Misanthropy at Time: Barbara Ehrenreich opined in Time magazine last week that the reason why there is a shortage of men in college is that they are lazy and party-minded. Of course, if a man had the audacity to suggest that women might be few in number in university math departments because of some personal trait--in this case math stupidity--he would be called a misogynist, and he might lose his job. According to the GSS, the average male college student goes to a bar once a month; the typical female student, several times a year. This is not enough a difference, nor is it indicative of enough male irresponsibility to explain why 60% of college students are girls. George Orwell once expressed his guiding belief, an idea which has caused the world so much gotdamn trouble: "The oppressed are always right, the oppressors are always wrong." For what it's worth, GSS vocabulary data support Flynn and Dicken's finding that black and white IQs have converged a bit. The gap went from .79 standard deviations (SDs) in the 1970s to .62 in this decade--a narrowing of .17 SDs. I looked at recent data, and the age group with the highest vocab scores were born in the late 50s and early 60s. Perhaps they escaped both the environmental deficits of segregation and the more recent meltdown of black families and neighborhoods and the takeover by hip hop culture. With a standard deviation of roughly 2, gay men are clearly smarter (at least in verbal IQ) than their hetero counterparts, but the gap is not as big as, say, between Jews and non-Jews. (Jews averaged 7.65 on this test). Lesbians also outscore straight women, and as we have seen with other indicators of functioning, bisexual women and especially men fall to the bottom. While homosexuality does not seem to indicate maladjustment, bisexuality does. Now it is possible that smarter people may reject convention more often than others and select themselves into homosexuality, but perhaps there is some other mechanism here. Perhaps homosexuals are drawn to environments that are more accepting of them which also happen to be rich verbally. One might argue that homosexuals enjoy the female advantage in verbal ability, but this must also apply to lesbians who have a high average, and both of these groups surpass straight females by quite a bit. Perhaps it's more self-selection for lesbians, and hyper-femaleness for gay men. Gay achievement might be explained by a fortunate combination of male competitive drive with female verbal fluency. Other ideas?